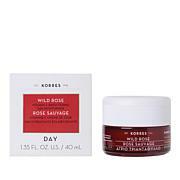 This lightweight day cream offers skin hydration and optimizes the look of skin elasticity while temporarily providing a matte-looking finish to the skin. The age-defying day cream is clinically shown to improve moisture levels, skin softness and the look of skin radiance and smoothness while reducing the appearance of fine lines. Ingredients: Aqua/Water/Eau, Glycerin, Dicaprylyl Ether, Dicaprylyl Carbonate, Cetearyl Alcohol, Alcohol Denat., Glyceryl Stearate Citrate, Isoamyl Laurate, Aloe Barbadensis Leaf Juice, Simmondsia Chinensis (Jojoba) Seed Oil, Distarch Phosphate, Imperata Cylindrica Root Extract, Acrylates/C10-30 Alkyl Acrylate Crosspolymer, Alpha-Isomethyl Ionone, Ammonium Acryloyldimethyltaurate/VP Copolymer, Ascorbyl Palmitate, Ascorbyl Tetraisopalmitate, Benzyl Salicylate, Caprylyl Glycol, Carbomer, Cinnamyl Alcohol, Citric Acid, Glyceryl Caprylate, Glyceryl Stearate, Helianthus Annuus (Sunflower) Seed Oil, Hydrolyzed Sodium Hyaluronate, Hydroxycitronellal, Lactic Acid, Lecithin, Limonene, Linalool, Olea Europaea (Olive) Fruit Oil, Olea Europaea (Olive) Leaf Cell Extract, Olea Europaea (Olive) Leaf Extract, Parfum/Fragrance, Phenethyl Alcohol, Phenoxyethanol, Rosa Canina Fruit Extract, Rosa Canina Fruit Oil, Salix Alba (Willow) Bark Extract, Sodium Benzoate, Tetrahydrodiferuloylmethane, Tetrasodium Glutamate Diacetate, Tocopherol, Tocopheryl Acetate, Xanthan Gum. I thought it might be too greasy because of the olive oil but its just perfect. I normally use the rose vitamin c brightening cream but felt I wasnt getting enough moisture with the new formula. This will be my go to from now on! Thanks!! really love this face cream,my skin is sensitive,its perfect,face feels so soft! This absorbs well and makes skin soft. 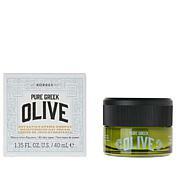 I use it at night as I have oily skin and don't need a day moisturizer. 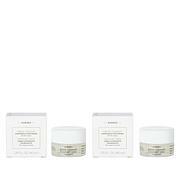 First Korres purchase. 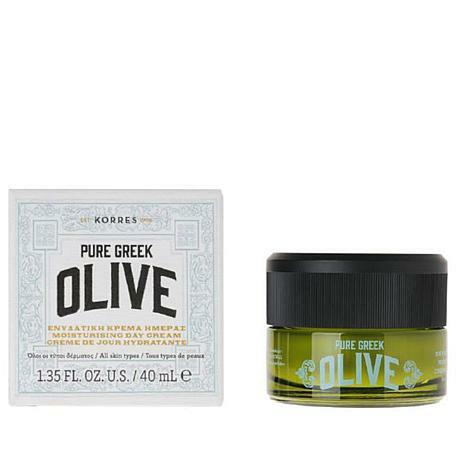 I like olive oil products & will try more Korres. I really like this cream it is luscious and the scent is wonderful. Nicely moisturizing. I'm giving 4 stars only because it's not a very big jar. I will use it up too fast!